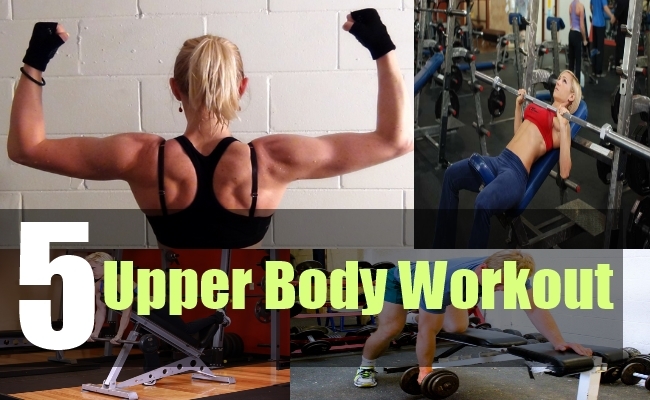 An ideal upper body workout should include exercises that works on chest, shoulders, back and arms. Everyone would want a body that would grab attention, so having a ripped upper body would serve the purpose. You can get a good upper body by just training 30 minutes in a day by following perfect workout routine. Using weights is beneficially it not only helps to tone muscle but also drop excess fat in that particular region. Some of the workouts mentioned below may consist using of weights like dumbbells or barbells, it’s advisable to start using moderate weights at first. One of the best chest building exercise that can be done at gym. Not only it works on chest but also with little alteration it can effectively work on triceps and shoulders as well. Bench press is done with traditional barbells that should be heavy enough to promote the results. Make sure that your back is straight and hold the barbell at shoulder’s width. Bring the weight down slowly till it reaches little above your chest and then lift the weight up by extending your arms. That makes one repetition. Do about 20 reps in 3sets. 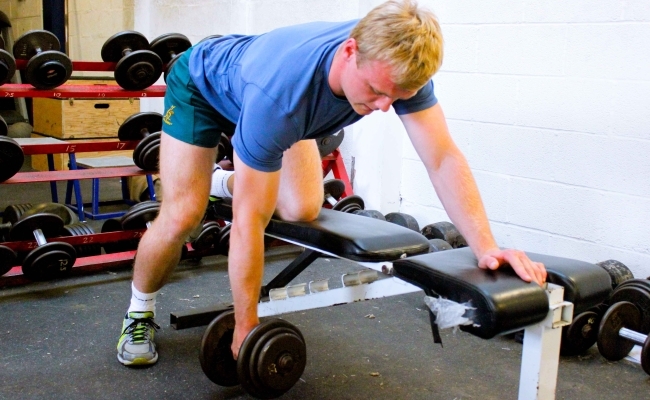 One arms dumbbell rows exercises your mid back and works on lats, shoulders and biceps. You would need dumbbell for this exercise, so choose heavy one. Place the dumbbell on each side of the bench. Put your right leg on the bench and bend your torso so that your upper body is parallel to the floor. Pick the dumbbell with your left hand and lift the weight up, till it reaches the side of chest. Then slowly bring the weight down and as you do this movement, remember to contract your back. Do about 25 reps in 3 sets. 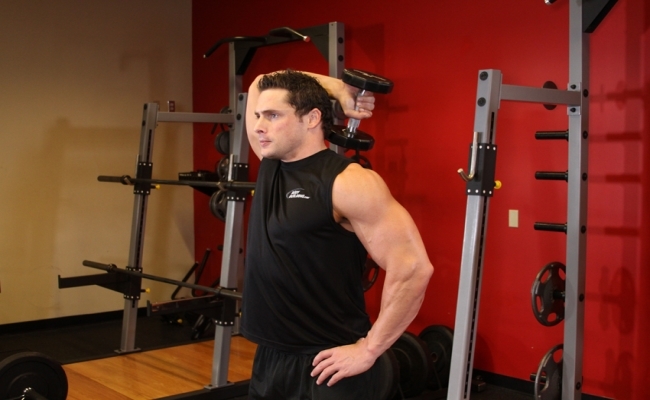 This exercise is considered to be the best shoulder building exercise that you can do in your workout schedule. First step is selecting the required weight and lift the barbell off from the floor to place it at shoulders level. That would be your starting position. Make sure that your back is upright and place the weight on the collar bone for support. Take shoulder’s width grip and lift the barbell up by extending your arms fully. Then slowly lower the weight back to collar bone and that would make one repetition. Do about 18-20 reps in 2 sets. If you want to build big biceps then this exercise is for you. It’s important to note that curling movement is good for making solid biceps. There are many variation that you ca do to make the workout even challenging. Take shoulder’s width grip and palms facing your. Pick the barbell from the floor and that would be your starting position. Now without moving your upper arm, lift the barbell up to your shoulder’s level. As you do this, remember to squeeze or contract your biceps. And then come down slowly and you can do as many as you want but start with 20 reps in 2 sets at beginning. It’s a good exercise to work on your triceps and there are many variations you can do in this workout. Start with holding the dumbbell with your both the hand and lift the weight to back of your head. Make sure that your elbows are perpendicular to floor as you hold the dumbbell. Move the dumbbell up without moving your upper arms, by only using your forearms. And bring the weight back down to back off your head. Do about 20 reps in 3 sets.